The future has arrived. At least, a certain part of it anyway. The part where the virtual world and the real world merge to confuse the hell out of us and usher in a new hybrid reality, a reality that seems more at home in the science-fiction of The Matrix than our everyday lives. What the heck am I going on about? I'm going on about a mysterious Florida startup called Magic Leap that recently raised $542m in funding for its second round of investment, giving the company a value of around $2bn. Investors include big time players like Google and Qualcomm. The reason these companies are happy to invest so much in the company (which is an awful lot even by the crazy standards of Silicon Valley) is because Magic Leap claim to have a created a piece of technology—which combines virtual reality with augmented reality and wearable computing—for a new type of experience they're calling "Cinematic Reality." This experience looks likely to involve interacting with virtual objects which are overlaid onto a user's field of vision. MIT Technology Review go into detail about how the tech works (it involves magnetic liquid and tiny mirrors), and explore the patents Magic Leap have filed which show the technology consists of a head display and sensors, powered by a computer which you wear on your hip (below). Unlike that other virtual reality device the Oculus Rift—due to launch publicly next year—which tricks the brain into seeing depth, Magic Leap uses a different technique that replicates the way we actually see the world as "light fields." Magic Leap’s patents suggest an alternative approach. They describe displays that can create the same kind of 3-D patterns of light rays, known as “light fields,” that our eyes take in from the real objects around us. Wetzstein and other researchers have shown that this allows your eyes to focus on the depths of an artificial 3-D scene just as they would in the real world—providing a far more realistic illusion of virtual objects merged with the real world (via). GIF of a video on Magic Leap's site, showing a tiny elephant in the palm of someone's hand. The display would be combined with motion cameras and infrared sensors so that your movement would be tracked, altering the images you see in tandem with you moving around a space. Allowing you to interact with these virtual elephants or whatever in any environment you happened to be in—your bedroom, your yard, in the office. 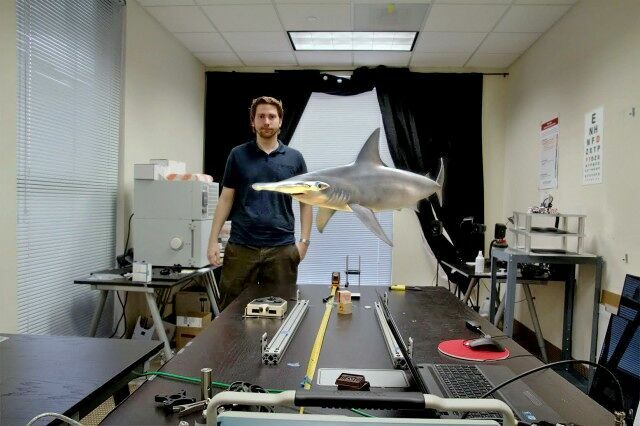 A digitally animated shark floating in an office. So, unlike Oculus, you wouldn't necessarily be transported to an entire new digital realm but instead would interact with virtual objects in our world. Or, as Magic Leap have tweeted. If you were wondering how transformative this tech could be, look no further than the gushing copy on the Magic Leap site itself which notes "Using our Dynamic Digitized Lightfield Signal™, imagine being able to generate images indistinguishable from real objects and then being able to place those images seamlessly into the real world." There's more of this breathless mystery-making on the company's—currently pretty sparse—blog, written by Magic Leap CEO and founder Rony Abovitz. If and when it manifests, the technology could really shake up the entertainment industry, gaming, art, communications, pretty much the whole spectrum. The possibilities would be quite incredible. We'll just have to wait and see whether the company can deliver on the hyperbole.